Just asking some questions about Rosin and the Bow. Since I'm new at this, and can't seem to find a local teacher for love nor money, I'm going to ask a few questions here. My first question, I see a lot of bluegrass fiddlers with a huge amount of rosin on the bridge of their instruments. I also see that to a somewhat lesser degree on other violin players, does that mean I should be laying the rosin down on the bow until it starts dusting up around the bridge? Second question, sometimes it seems like that 'sweet spot' of a good bowing tone moves from one string to the next. You know what I mean, that nice spot a little over halfway between bridge and fretboard (more towards fretboard). Is it normal for this spot to be different on different strings? Is it possible I'm just doing something wrong like not enough rosin? Fourth question, should I rough up the cake of rosin before using it? It seems that it gets some of that stuff on the bow, because it does make a sound, just sometimes there's a strange overtone that's very dissonant. Anyways, if I can think of anything else I'll ask here. Also, I did use the search function prior to posting this, so my apologies if I missed a very pertinent thread that would have explained this to me before posting. first: it is never necessary to apologize here for asking a question,,,even if it has been asked before,,it has never been asked by you! And we like talking about violin stuff. Rosin can be way too much and will make terrible sounds on really good strings. Always wipe off your violin and strings after a good workout. Rosin can cake on your strings. Just wipe off with a cloth or if really bad add a little water(spit). I have used alcohol but was very careful. You don't HAVE to rough up the top of rosin, it just makes it faster in the beginning. Someone else will answer about the sweet spot, I ain't found one yet, but that's because there's a troll livin under my bridge. No. I've never found anything better than a violin bow for pointing at stuff. Now this sweet spot you are talking about is I guess more or less exactly half way between the bridge and fingerboard ( we don't call it a fretboard because there are no frets on a fiddle). Well this is where you will (certainly as a beginner) make the best sound, the sweetest sound. However as you progress you will learn to play nearer the bridge and sometimes even over the end of the fingerboard for a different sound or maybe I should say dynamic. Never over apply rosin to your bow, use it sparingly. There is no need to apply so much that you have a snow drift under your bridge and of course rosin is very damaging to the varnish. Always clean your strings by wiping after practice or playing, and if it is caked on use a small amount of spirit, but cover the bellow of your fiddle to avoid any drips that may fall. 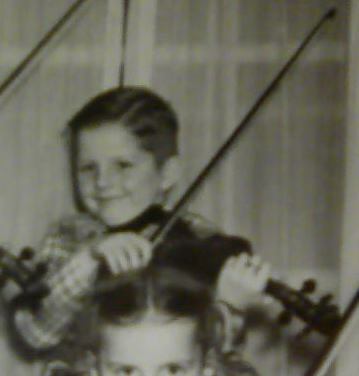 Then examine your fiddle for specks of rosin paying particular attention to under the bridge where it tends to build up. Use some thin paper tissue to remove this. Also check under the chin rest. Yes bows do make great pointers, but they function better with the violin, a bit like a horse and carriage! All rosin blocks are smooth and shiny when you first buy them, but you do not need to rough them up, just pass the bow across the block and slowly but surely it will look less smooth. Think I should mention at this point that you should never, ever touch the horse hair with your fingers or palm of the hand. Any sweat will immediately be absorbed and then the hair will not be able to hold rosin so easily. You probably know this, but I just thought I should mention it anyway. Hope this has answered your question, but if not just ask again. to be honest, It doesn't matter a hill of beans. If you're busy, lazy, or just want everyone to see you have stock in a rosin company leave it on there and wear it proud. I usually clean (and I mean "take it apart" clean) my bows about once a year or so... using 180 proof alcohol although just about any proof will work (the higher the better) allowing my bow hair to dry well without tension on it. I also clean my strings with alky as well but mind yourself DO NOT get any alky on the finish of your violin, it will melt the finish or at the least leave a spot. If you wipe it there goes the shiny finish of shellac or varnish as it's dissolved in alcohol. I try to wipe off the excess rosin from the top of my violins after I play but sometimes I'm just lazy, forget or whatever and it's not a big deal. Wiping it off keeps the finish in good shape as rosin is basically hard pitch, so treat it as such. Third question I'll skip, you already know the answer to that one! Ha. Yes, you can rough up the rosin a touch before briskly rubbing the hair across it. It helps to transfer the rosin to the hair but don't go crazy, trust me, it'll get on there if you apply good pressure and quickly rub it back and forth. You will find as you play, the bow will need to move a certain amount before any sound is produced that you can hear... from a 1/2" down to maybe an 1/8" or 1/16". The least amount of motion the bowhair makes before the strings are excited into making a sound is the most desirable. Rosin affects this, or the amount of rosin I should say. Not enough and it squeals and squeeks and slides over the string on occasion. It also for quicker string crossings, quicker change at the top and bottom of a bow stroke and less loss of tone from a string as you come to the end of the note. This also allows for a smooth transition between notes as you will see when reading music, unless there's a definite rest on that sheet, the notes stream from one to the other as quickly as they can be played. I'm not talking about the count value of the note, whether it's a 1/4 note or 1/2 note or full note... I'm talking about the smooth transition from a C to a G or anything else... it can't just stop at a C then a space and then play a G unless there's a rest purposely put between them. So far, I have also learned that the first year is really a feel and see period in your playing as a beginner and then it turns into a "wow, I can really make that thing sound good enough that people know what I'm playing!" kind of practice. I've noticed that every note doesn't have to be perfect but a lot of them do, as playing isn't about a single note, it's about a lot of notes one right after the other. It all comes together if you stick with it. Nice replies from all actually. I just wanted to comment on your question Joe. I love the way you asked the questions. Nice sense of humor and fun writing. So I try to wipe strings before every practice. I don't get a lot of rosin build up on the strings or violin. I use Baker's rosin, although my cake has been through a lot and I am worried about the future of it. As far as the bow.... my grand daughter and I went about the house casting spells with our bows/wands last week. Best pointers ever. Bows that have lost their hair, make great back scratchers. I just noticed Chinafiddlers reply about me calling it a fretboard LOL! So Right sir! However, if I worry excessively over it could it then 'become' a fretboard? ( we don't call it a fretboard because there are no frets on a fiddle). I beg to differ with you on that one, sir. Most don't, but some do. Just wanted to pop in and add my 2 cents I currently use Hill rosin. Its pretty cheap but not the cheapo rosin, but not like the bakers rosin (though i am on their wait list, i doubt i'll be seeing any anytime soon) Any who, I fall into the category of those who, once there is plenty of rosin on the strings i just do a few swipes every now and then when i'm not getting as good a grip on the strings as i'm used to. I don't seem to have crazy clouds of dust flying around and everything seems to sound pretty good. To clean my strings i actually use a wine cork. It seems to scrape a vast majority off the strings without having to worry about getting alcohol on the violin. 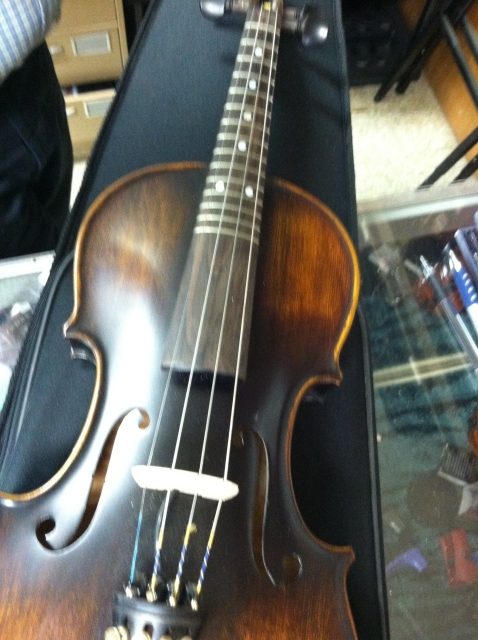 then its back to playing on "like new strings" I just wipe down the violin and call it a day! Thanks Rockinglr, I had forgotten about the wine cork. Think I have to open a bottle today to get one. Yep that's my reason for drinking,,,but, but ocifer,,I jus needed the cork!!!!! That is one very cool fretted fiddle! I'll use the wine cork trick next time I need to clean strings, thank you! Great questions and great answers from everyone. I don't even feel I can add anything. Got some good laughs though. ROFL "is there anything more effective of a pointer than a violin bow?"